I've been trying to learn clustering algorithms lately. I was planning to write about them this week, but some last minute refactoring to remove redundancies and make the code more readable resulted in everything going to hell. So I guess I will have to write about them next week. Almost all clustering algorithms (at least the ones I have seen) seem to be non-deterministic, mainly because they select documents randomly from the collection to build the initial clusters. As a result, they can come up with wildly different clusters depending on how the initial clusters were formed. In my previous (un-refactored) code, for example, the K-Means algorithm converged to the same set of clusters most of the time, but with the changes, they no longer do. Working through this for some time, I decided I needed to see for myself what the "correct" clusters were. So if I could visualize the documents as points in the n-dimensional term space, clumps of points would correspond to clusters. The problem was that I had only 2 (or maximum 3) dimensions of visualization to work with. Luckily for me, smarter people than I have faced and solved the same problem, and they have been kind enough to write about it on the web. The solution is to do Dimensionality Reduction, extracting from the term-document matrix the first 2 or 3 most interesting components (or Principal Components) and use them as the values for a 2-dimensional or 3-dimensional scatter chart. The mathematical background for Principal Component Analysis (PCA) is explained very nicely in this tutorial, which I quote verbatim below. The mathematical technique used in PCA is called eigen analysis: we solve for the eigenvalues and eigenvectors of a square symmetric matrix with sums of squares and cross products. The eigenvector associated with the largest eigenvalue has the same direction as the first principal component. 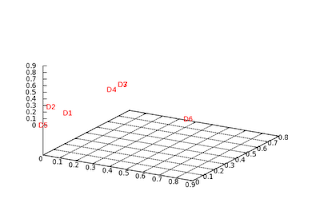 The eigenvector associated with the second largest eigenvalue determines the direction of the second principal component. The sum of the eigenvalues equals the trace of the square matrix and the maximum number of eigenvectors equals the number of rows (or columns) of this matrix. It then goes on to explain the algorithm that should be used for reducing and extracting the most interesting dimensions (See Section 6, Algorithms) for a non-square matrix such as our term-document matrix. Essentially, it decomposes the term-document matrix A using Singular Value Decomposition (SVD) into 3 matrices, U, S and V, where the following equation holds. Here S is a square diagonal matrix, where values are in descending order down the diagonal. So for a 2 dimensional reduction, the principal components correspond to the first 2 columns of V, and for a 3 dimensional reduction, the principal components correspond to the first 3 columns of V.
The Java code to generate data for drawing the charts is trivial, mainly because we use the Jama matrix library, which does all the heavy lifting for SVD calculations. The term-document matrix is generated from my 7 document title collection that I have been using for my experiments, using the following snippet of JUnit code. See one of my earlier posts titled IR Math in Java : TF, IDF and LSI for the actual data and details on the classes being used. From the charts above, it appears that the following clusters may be valid for our test document set. Notice that although D3 and D7 appear really close (overlapped) on the 3D chart, they don't seem to be close going by the 2D chart or the data. In any case, the results look believable, although not perfect, but that could be due to dimensionality reduction and/or the small data set. I think this post may be helpful to programmers like me who are just getting into IR (most people who are heavily into IR would probably know this stuff already). Text mining algorithms, by their very nature, need to deal with n-dimensional data, and the ability to visualize the data in 2D or 3D can be quite enlightening, so this is a useful tool to have in one's text mining toolbox. Interesting post. Are the columns of the 2-dimensional array given as input to svd considered to be the objects you want to reduce the dimension of? Hi, thanks, and yes, each column of the input 2-dimensional matrix corresponds to a single document in my collection. I want to compare similarity between documents using LSI based on words contained inside. In the end, I want to visualize the cluster of documents. 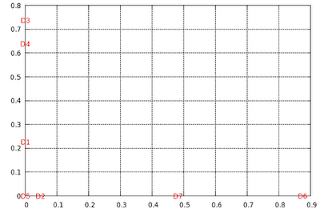 Suppose I get the LSI matrix already, what should I do to graph this matrix? Do I need to compute the similarity between document and do clustering manually? or I just take two matrices from SVD computation and visualize it. Actually, I still confuse the difference between SVD-only computation and LSI. Hi lkhwan, yes, I think once you have done the SVD on the TD matrix, you would have to compute the similarity between the document columns. I ahve done indexing with Lucene using about 370 documents. Now, I would like to perform TF/IDF normalization or if not, straight to kmeans clustering. I don't know which codes that you have here that I can use.. I really would like you to show me.. thanks. Hi hannister, if you download the code in jtmt.sf.net you should have all the necessary classes to run the JUnit test which will dump out the cluster coordinates and you then use gnuplot to draw the charts. The only difference between your approach and mine is that your data is in Lucene. To run KMeans using my code, you will have to convert the data into a TD Matrix (a 2D matrix with terms as rows and documents as columns, normalized using TF/IDF). This code is not available but it should be fairly simple to write (look at examples of using the Lucene term API for inspiration). The problem with the stuff I wrote is that its all in memory, but since your dataset is small, it should not be a problem. Hi Aarti, I generally test my code using JUnit tests like this one. Eclipse can run JUnit tests, there is plenty of documentation available such as this one. If you prefer to use a main() method, it is easy to build one based on the contents of the corresponding JUnit test.